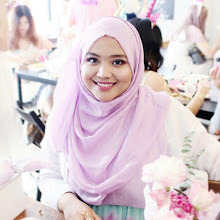 Sue Melati is a Malaysian Makeup Artis (MUA) that normally do makeup touch for Malaysian celebrity. 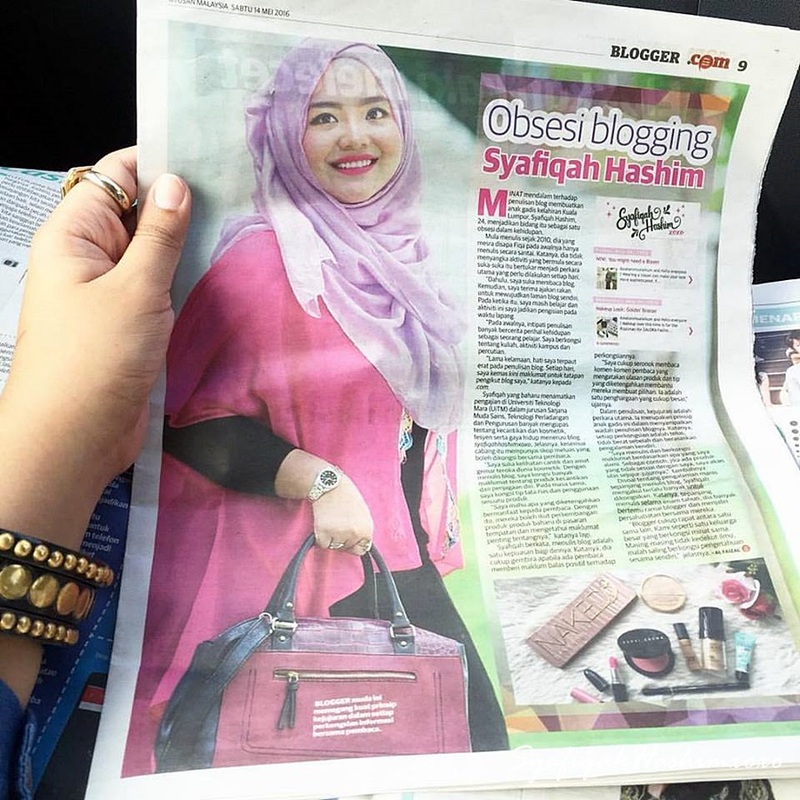 She also do makeup for Television show like Muzik-Muzik, Nona, Mentor TV3 and more. You can find her on facebook. Other than that, she also active doing a makeup class. This is actually good for those who wants to learn more about makeup technique. As we all know that every makeup artist has their own specialty and skills. 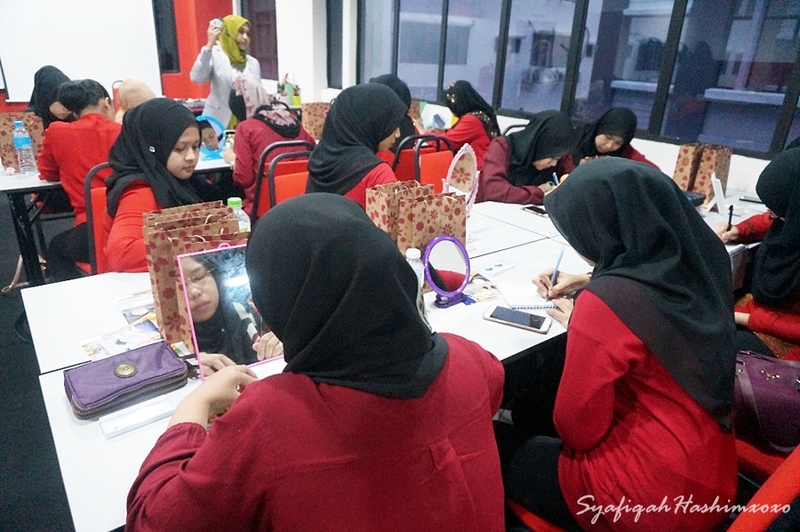 It is a good thing that we can learn their skills to improve our skill and learn more technique and trick in makeup. She do makeup class from basic to profession makeup. 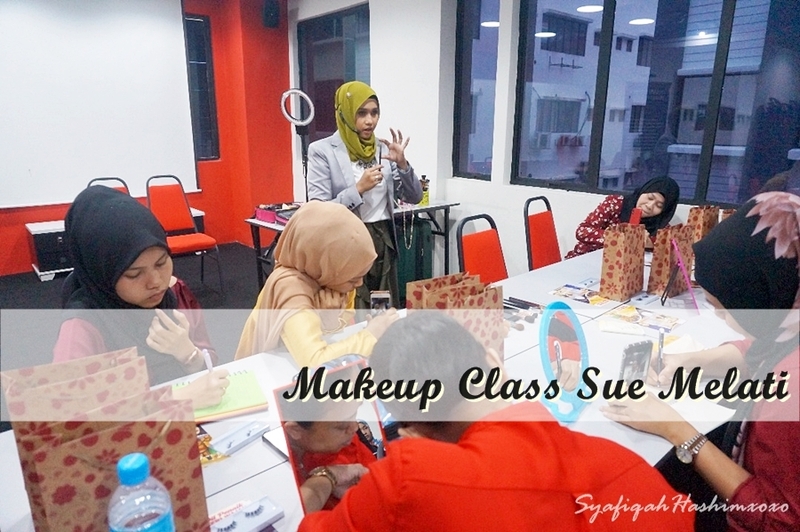 So if you're beginner you can always go for basic makeup class and upgrade to advance and lastly professional. In her Makeup Class, she will demonstrate her skill and technique step by step. Form skincare technique and makeup skill. She make sure her student listen to her and note-down what she's mention. This is actually good, so that the student doesn't loss their focus and keep on learning. After demonstration, normally she will do hands on to every of their student. Make sure that her student repeat and understand what she just taught. Among the tips she will mention is, how to choose the right color of eyeshadow, pick the right tone of foundation, skin care step before apply makeup and more. Ohh yaaa! 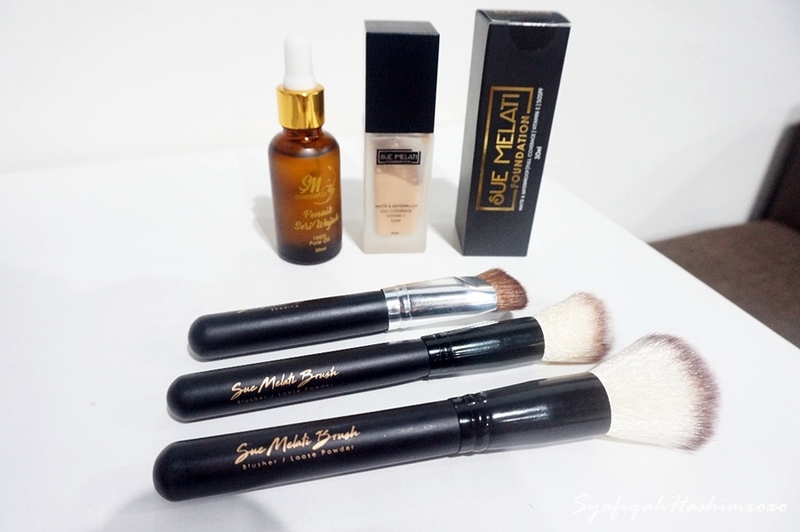 Sue Melati also come out with her own makeup products. 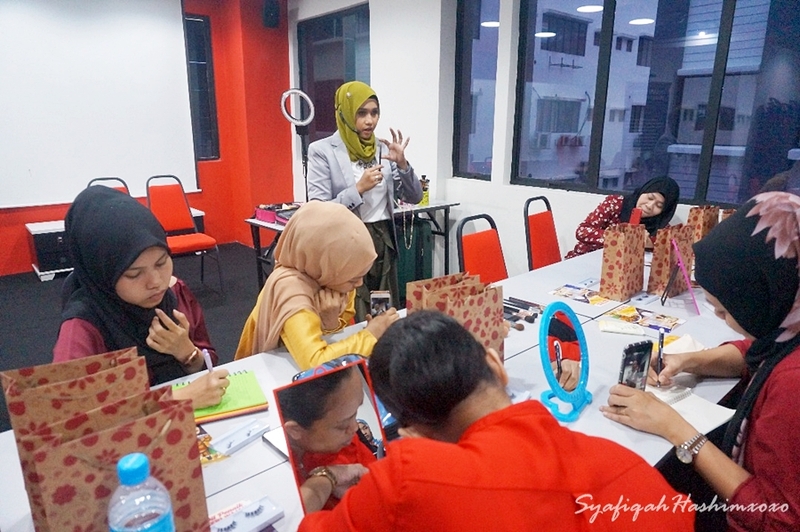 It is common in Malaysia for MUA to come out with their own products as they have tested so many product previously and this is the time for them to formulate the right formulation for their customer. 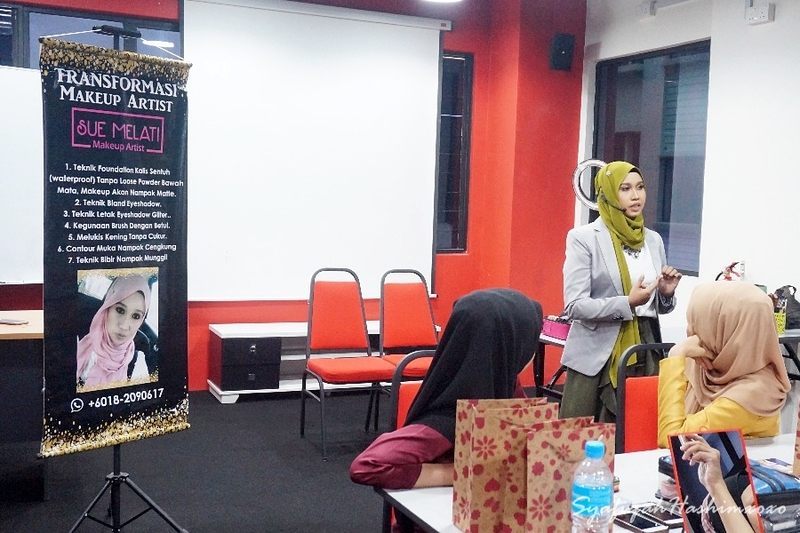 More products from her that you can try such as, Penaik Seri Wajah Oil, Sue Melati Foundation and Makeup Brushes. I really love to support our local products. After I heard about it, I actually have high expectation for this foundation because normally MUA will make a good product as they have experience in makeup world and been doing makeup service for others with different type of skin. This is how the packaging looks like. For now they only have one shade for the foundation. The founder claim that they will bring out more colors with different shades this year. They also claim that in this foundation also contain Vitamin C and E, Sakura extract and Aloevera. At first I'm quite confuse on how to blend this foundation as I use a beauty sponge but this foundation does not work so I take foundation brush and blend it. You have to blend this foundation quickly as it is mattifying easily. It take some times for me to blend this foundation but I have to blend it fast as it will stay on the skin right away. The shade is suitable for skin my tone not that obvious because at first I thought this color a bit light. I think this foundation doesn't go well on me. I don't know why T_T. I heard from other people that they can use this foundation easily and not much problem. But not on me T_T. I have to say this foundation doesn't suitable for me as I probably sweating much and the foundation starts to fade off and leave my skin bercapuk T_T. I bet this foundation suitable for those who does not have much problem on their skin and for those who not sweating easily. The coverage for this foundation is light to medium coverage. I bet this foundation will be nice for those who has not much skin problem. Just to explain that the review is base on my experience using this foundation. I hope you find it helpful. I wish they can re-formulate the foundation so that it is wearable for someone who sweating much like me can wear this foundation as well. Butttt you can always register for her makeup class and learn more makeup technique form Sue Malati. I see. Later on I try again with argan oil pulak..
Foundation ni memang cepat matte so haritu mua ni campur dengan argan oil ... kalau kulit gelap kena mix dengan bedak asas kale coklat..
Faundation dan minyak penaik seri sue melati sangat terbaik. Mudah disapu dan cepat rata tanpa byk kali sapu. Terbaik.